The Elastic Maps Service powers all the geospatial visualizations in Kibana (including the Maps app) by serving basemap tiles, shapefiles, and key features that are essential for visualizing geodata. The Elastic Stack welcomes all types of data, including the geo markers that tie information to location. Create a heatmap of brute-force login attempts to spot the location of a malicious actor or view the number of leads from your latest marketing campaign by country. Zoom in (or out), drill down, and interact with your maps to find the "where" that matters. Data layers are built on basemap tiles for stunning geospatial analysis using the Elastic Stack. See your data come to life with detailed vector shapes and get granular with 18 zoom levels. Need a feature? 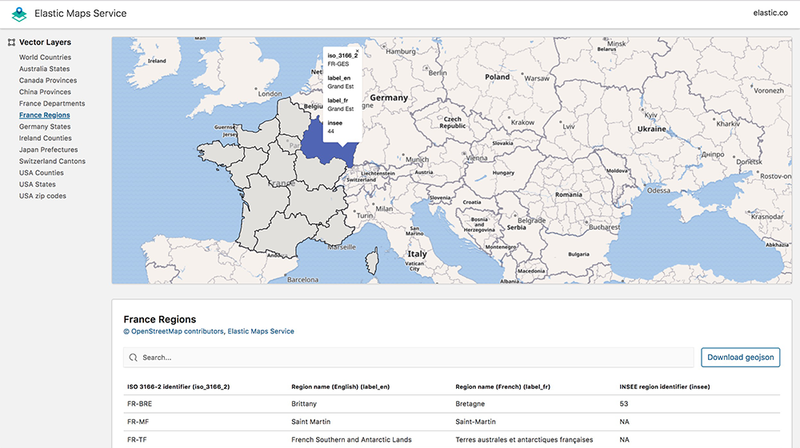 Elastic Maps Service is highly customizable through Kibana. Plug, play, develop your landscape. Made by the creators of Elasticsearch and Kibana, Elastic Maps Service works seamlessly with the Elastic Stack. Expect the same high availability and speed you've come to love from Elasticsearch and Kibana in your map visualizations. Best of all, Elastic Maps Service is not tied to releases of the Elastic Stack, meaning your regular feature updates happen in the background, outside of general releases. No need to wait. No need to update. The Elastic Maps Service produces basemap tiles based on OpenStreetMap data, which is licensed under the Open Data Commons Open Database License (ODbL). It also uses derived coastline data provided by OpenSteetMapData.com, and the Apache 2.0 licensed Kartotherian. In addition to hosted tiles, we provide out of the box GeoJSON files derived from OpenStreetMap contributors, Natural Earth Data and Wikidata. Explore the vector layers available in Elastic Maps Service. Certain features of the Elastic Maps Service, such as advanced zoom levels, are governed by Basic license and are not available from hosted Elasticsearch and Kibana offerings from third-party providers, such Amazon Elasticsearch Service. See Terms of Service. Not a Kibana User Yet? Get Started Now. Setting up the Elastic Stack is easy.